We already know that globally, human diets are seriously out of balance. We spend far too much effort growing cereals like wheat – much of which ends up being fed to animals – and nowhere near enough time and resources producing vegetables, fruit and sources of plant protein, like pulses and nuts. In this context, a new report from the unusually named “EAT-Lancet Commission”, called Food in the Anthropocene: the EAT–Lancet Commission on healthy diets from sustainable food systems has been causing a bit of a stir. The report, produced over a three year period, and supported by a Scandinavian thinktank (called EAT) and the UK’s Wellcome Trust, has some profound recommendations including reducing the proportion of meat and dairy in our diet, and increasing what are termed “plant-based foods”. It’s a long, dense report. It covers a wide range of issues, including human health and environmental impact, especially the climate change impact of food production. The simple message is contained within what the authors call the Reference Diet, which outlines which foods nutrients should be derived from – and it is mainly (but not exclusively) vegetarian. As an aside, I have a slight problem with the phrase “plant-based foods.” Other than mushrooms (which are not plants, but fungi), all food is plant-based because plants form the foundation of the planet’s ecosystem. Plants and their components – seeds, the flesh of underground tubers, and so on, are not “plant-based”, they are plants. And anyone eating fish or meat is eating an animal which lived and grew by consuming plants. If you want to be pedantic, it’s true that marine fish (and shellfish) eat a diet derived ultimately from phytoplankton – which is a complex mixture of tiny plants, bacteria and archaea. But, to a simple approximation, and for most purposes, it’s fair to say that all food is plant-based food. The report highlights the appalling amount of food which is grown and never eaten, but lost or thrown away. It supports the Half Earth strategy to halt this current mass extinction of Nature that we have caused. And it argues, quite rightly, that the retail price of food does not reflect the total cost of its production and consumption. It proceeds through the evidence which points towards an urgent need for us, at least in the West, to change our diets or face environmental catastrophe. And whilst it recognises the need to reduce Carbon Dioxide emissions from agriculture to zero, I was surprised that the authors did not feel that the impact from the two other main greenhouse gases associated with agriculture, Methane and Nitrous Oxide, also needed similar reductions. Methane (from agriculture) is produced by ruminants such as Cows and Sheep (and rice paddies), while Nitrous Oxide is released mainly from the use of artificial fertilisers made from Nitrogen, about which I have previously written. The report only sees the need to keep levels of these two gases at their current levels – this may be a sop to those who advocate the need to continue using synthetic Nitrogen fertiliser (and the industry that depends on it) instead of adopting agro-ecological approaches which reject this argument. Indeed, the authors actually recommend that the application of Nitrogen fertilisers, (which we know cause so much damage to the environment), should increase – albeit with a redistribution from farmers in the developed world, where use would decrease; to farmers in the developing world, where use would increase. This is part of what is called “sustainable intensification”, whereby (in theory) more crops are grown on less land, with more efficient farming techniques. It has to be said that this is controversial – and at odds with the principles of Agro-ecology that Lush supports. An agro-ecological approach would often use animals, via their manure, to redistribute nutrients to fields where they are needed to help crops grow more quickly. There are some other real contradictions – for instance the reference diet include up to 6g of palm oil, from Oil Palm. There is no sustainable source of Palm oil, so including any in a reference diet would bring into question whether the authors had fully considered all the environmental impacts of the foods included. Even under the best future scenario where global food waste is halved, the authors anticipate around 30% increase in Palm Oil production over the next 40 years. This increase would surely devastate what little is left of the Tropical Rainforests of South-East Asia, and elsewhere. Although welcomed in some quarters, perhaps more surprising than the report’s findings, are the extraordinary attacks aimed at it, for being part of some global Vegan/Vegetarian conspiracy. No seriously. I have read critiques from people who I had previously considered to be sensible, which claim that this is part of a secret global food industry plan to get us all eating a “plant-based” diet over which they will have total control – forcing us all to become vegan zombies. This ties in with a more general backlash against Veganuary, which is being painted as something supposedly forcing people to give up eating meat or dairy products. But the reference diet specifically states that up to 84g (3 ounces in old money) a day of protein can be derived from meat, eggs or fish; plus up to 500ml of milk of equivalent in cheese/yoghurt. How many subsistence farmers and the families they feed, across the world, get this much animal protein every day? The report references figures of around 30g of animal-derived protein per day per person, globally. So the Commission is actually recommending a substantial increase in animal protein consumption, per person, from the current situation. It’s just that this would also mean a substantial, or indeed dramatic, reduction in animal protein consumption from the current high rates in some western developed nations. Such as the UK. Others have criticized the report for failing to recognise that sustainably produced red meat can produce healthy food, support Nature and tackle climate change. While this is true, it also seems somewhat parochial – growing lamb or beef organically on the Welsh hills is not exactly representative of the kinds of problems being identified at a global level by the authors. Conditions in the West of Britain and Ireland are certainly conducive to growing grass and (in the past) wildflowers, which produces fantastic quality meat. But this cannot sensibly be extrapolated to provide a solution to our global food crisis. Could this splenetic attack have anything to do with the IEA being funded, even now, by Agri-Industry? 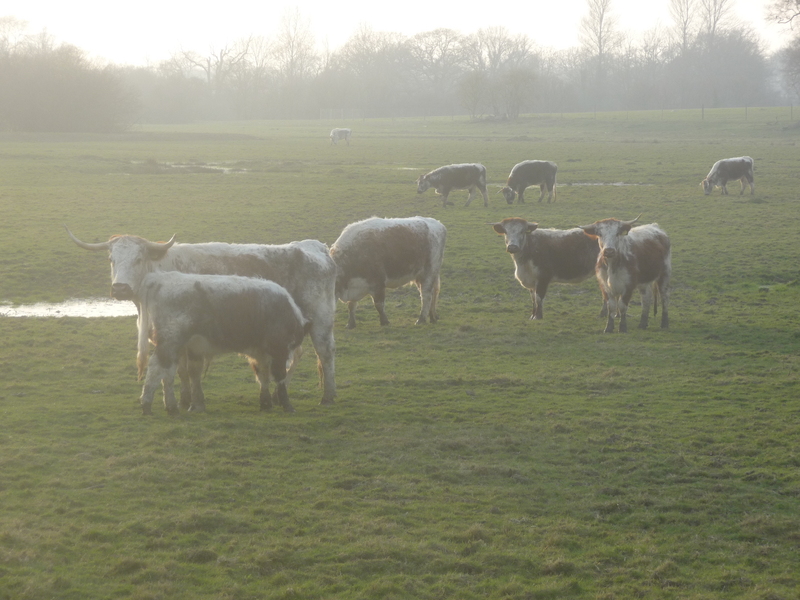 Greenpeace revealed recently how the IEA was being funded by US intensive beef producers, looking for ways to access the UK’s food market post-Brexit, by reducing food and animal welfare standards. I think this report makes a serious contribution to the debate, both here (especially as Brexit-driven impacts on our food system loom ever closer) and internationally. While some of the solutions it proposes are problematical and therefore unpalatable, it at least recognises the problems of a dangerously imbalanced global food system, and the need for fundamental change. UK conservation professional, writing about nature, politics, life. All views are my own and not my employers. I don't write on behalf of anybody else. This entry was posted in Food, food security, veganism and tagged EAT-Lancet report, veganuary. Bookmark the permalink. Thank you Miles; very important – those groups and individuals steering farming & nutrition through their ‘science’ usualy have some agenda; and more often very little practical experience of farming. Not much here in the academic literature to be trusted, for this and a myriad other reasons. No wonder we are in such a mess; it has long been thus, ever since the early despots destroyed the Fertile Crescent for organised agriculture … to their benefit. Yes. I see the Fertile Crescent and the beginnings of agriculture as marking the start of capitalism – a model based on the ludicrous notion of infinite growth on a planet with finite limits. Thank you Miles for this. Informative (and yes important) as always. I’m currently writing a plant-based book (I understand your reservations about the term, but I still use it as in meat-eating diets it’s very much an indirect way of eating plants, so the distinction is useful as people understand ‘plant-based’ to mean ‘direct consumption of plants, rather than 2nd-hand’). Plant-based? I’m a pedantic sod, but It’s not difficult to understand the term, and I don’t think it’s worth any worry about the wording. A term I dislike, because of its non-specific interpretations, is “balanced” when it refers to diets, but surely anyone who *avoidably* harms any animal, let alone eats it, is unbalanced. (WBCSD) and the EAT Foundation – and is funded by (among others) Arla, Bayer, Danone, Du Pont, Pepsico, Google, Kelloggs, Nestle, syngenta, Unilever, Yara. Who wouldn’t want those companies telling us what to eat “To Save the Planet” for themselves? While buttering their toast on both sides. come now John – you’re not falling for this “Big Food will force us all to become vegans” conspiracy theory are you? They make far too much money out of meat to be interested in such a move. There’s no conspiracy unless conspirators have taken to issuing Media Releases (albeit in coded language) prominently displaying their brand logos to hide their affiliations in plain sight and launching their high-profile campaign at the WEF. I prefer Occam’s explanation – it’s just money and marketing. No point in junk food purveyors letting opportunities to sell more junk food go by – a win-win scenario is the best outcome. I suspect that is what is driving the noisy criticism from nutritionists, who already have a view on synthetic food and its “healthy and sustainable” mantra, but possibly thought it was unlikely to become popular. Why it would surprise them that the agri-food industrial complex is backing ersatz food is a mystery. ah – you have fallen for it. Oh well. ‘Big Anything’ is going to be unsustainable, polluting, employment destroying, inequitable, opaque, etc; Schumacher explained this all clearly enough in the 70s (and Kropotkin long before that). Surely the catastrophe of the past 50+ years Big Ag showed us all this ? Does this report explain the clear proven rule that the smaller the farm area the greater the productivity ? That only composts can legitimately be used to fertilise crops (or else the bulk of the nutrient will be lost and pollute) ? That simple measures like rainwater harvesting can prevent flood misery while enabling (typically) a doubling of productivity through irrigation ?